The workhorse of face brushes, Brush 13's dense, dome-shaped silhouette optimizes the application and finish of all types of foundation—plus mineral powder, bronzer, blush, and more. Supremely soft, all-white natural hairs glide over the skin, building coverage from sheer to full seamlessly without disturbing dry, flaky skin. Brush 13 is also available with The Face Set. 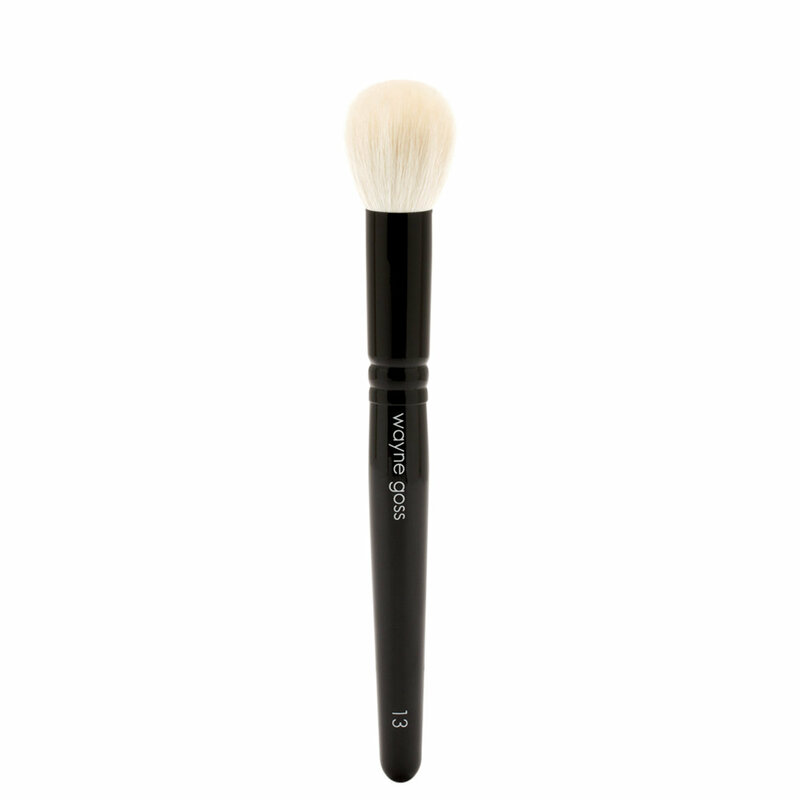 To apply cream, liquid, or powder foundation, use Brush 13 to buff product into the skin with circular motions. Brush 13 works especially well with mineral powders. Use light strokes to build up blush, bronzer, and highlighter wherever you desire. 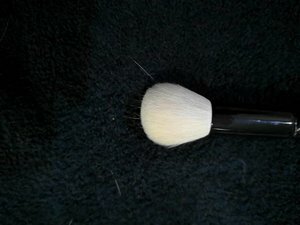 I wanted to love this brush as I have been purchasing Wayne Goss brushes in the past 2 months from Beautylish because I love how soft they are. This brush was a disappointment. As soon as I got it I used it on my client right away and I saw hair falling on my client's face. I was so embarrassed but still gave it the benefit of the doubt. After my makeup gig I decided to clean my brushes and when it came to this brush I was shocked to see more hair fall out. About at least 100 hairs fell out on my first use and it wasn't a pretty sight. I don't think it's normal at all like they say happens in the first few uses as the production packs more than enough hair and so on. 100 hair fall out on the first use is not normal. I love Wayne Goss brushes but I am really sad about this particular brush. I hope it is a fluke because other ladies have given it a rave review. I am just really sad that I got one that wasn't of good quality. I have used this for liquid foundation and I am impressed by the quality, this does not absorb liquid foundation product, amazing! It applies liquid quite well and easy to buff with. It is not as dense as other foundation brushes I have used, there is more flexibility in the hair and it is domed not tapered. This could also quite easily be used for blush as well. I am revising my original review, as I have learned new ways to use this brush. It shed quite a bit when I first got it, but it has stopped after a couple of washes. Adjusting my application method has also made a difference. Prior to purchasing this brush, I had used only low- and mid-ranged brushes. This was my first high-end brush purchase, and I didn't really know how to use it. I needed far less pressure with this brush than I was used to, because of the quality of the bristles. They are both strong but soft. Too much pressure on the brush does seem to cause it to shed. When the brush first arrived, it was small—minuscule, even—for a face brush. After a couple of washes, it fluffed up into a gorgeous little ball, approximately 3.5 cm across. The original intent for this brush, when I purchased it, was for mineral makeup. It's a bit on the smaller side, so I find that it takes longer than I would like to apply a full face of mineral foundation. That said, I prefer smaller brushes for blush, bronzer, and contour because I like the precision it offers. The brush is wonderful for liquid and powder foundations, blush, bronzer, contour, and highlight. Blending liquid foundation with this brush was mind blowing. It buffed everything to a flawless finish in seconds. Blending powder products is a breeze, and I find it very easy to wipe off product between product applications. Perhaps most crucially, I have found that it doesn't micro exfoliate my very dry and dehydrated skin. If you get just one Wayne Goss brush, let this be it! I have multiple brushes from different companies like sigma, tarte, artis, Sephora, and IT cosmetics, but they are all synthetic. These are my first natural hair brushes, and I love them! I do still like my other brushes, but these are better. Yes,yes it is a little price, but it's worth every penny on it! Absolutely high quality hair which provides superb ability to blend,soft and pleasing the skin. I am not professional make up artist,and use that brush to put a foundation ,blush,contour,blending. .anything you can think off. No hair shedding, no skin hurting!! Recommended to all! I wish i have this powder brush sooner. It pick powder and apples on yr face nicely. So soft and perfect size. I have sensitive skin with acne and eczema. The original brush has been great for blush without aggravating my skin further. This one feels even softer and is worth the investment (I have the Billy B and it.Cosmetics brushes and I feel the Wayne Goss ones are better). It took me a bit to get the hang of this brush...(it's not as dense as the ones I had). However once I go the hang of it... I loved it. I use a lighter hand and pickup less product to get the look I want. Less is more when working with this brush (and all the W.G. brushes I believe)! The brush does all the work... so I do less by using a lighter hand/touch and picking up less product ( a little goes a long way). I use this brush to apply loose mineral powder foundation and it's wonderful. 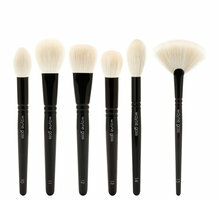 Love Wayne Goss and all of his brushes! It blends so well. Truly my holygrail. Worth. every. penny!